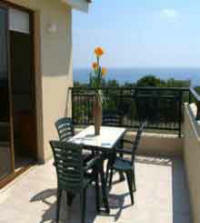 GENERAL DESCRIPTION: Two 3 bedroom villas set on a hillside offering full sea and mountain views. 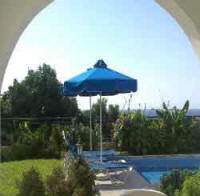 Each villa is in a private and peaceful location surrounded by banana plantations, walnuts groves and other fruit trees. 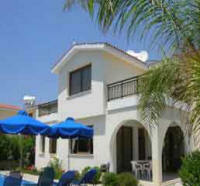 Situated in the pretty village of Kissonerga between Paphos and Coral Bay. SLEEPS:6 max Three bedrooms with en suite facilities to all bedrooms. The first of the the three bedrooms is located on the ground floor. This is a twin bedroom with en suite shower room so it is suitable for people who might struggle with stairs or are lightly disabled. The master bedroom has a double bed, dressing area and en suite shower facilities. The other bedroom is a twin with en suite shower room. Both upstairs bedrooms have private balconies with wonderful sea view, ideal for watching the specially magical sunset over the sea. 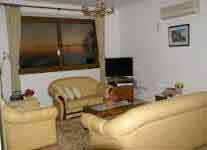 FACILITIES: The ground floor comprises of an open plan kitchen, dining and living room with leather sofas. there is also the ground floor en suite bedroom and a separate guest cloakroom on this level. Marble stairs lead to the first floor and the remaining two bedrooms. 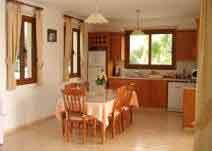 The Kitchen is fully equipped with all appliances including kettle, coffee machine, toaster, oven. hob, fridge/freezer, microwave, washing machine dishwasher and water cooler. There are patio doors leading out on to the terrace . There is a private 8 x 4m swimming pool surrounded by landscaped gardens. There are roman steps in the shallow end making it ideal for children and elderly persons. 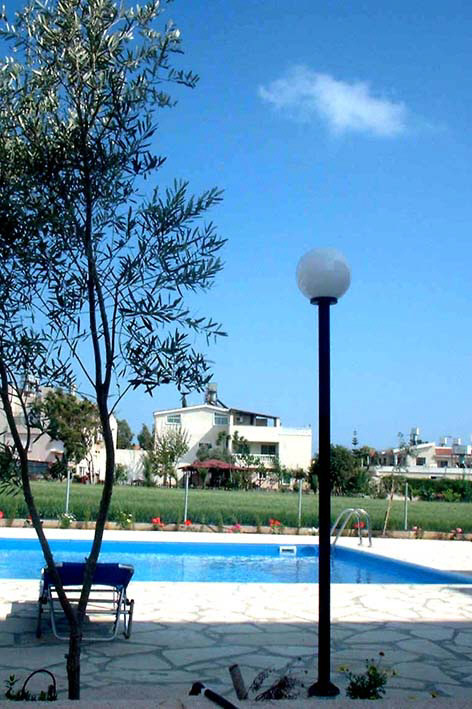 The pool is surrounded by well tended and mature gardens with lawns and flowers. There is also a pool shower, sun beds, umbrellas, table and chairs plus a brick built barbecue. The villa has child stair gate at the top and bottom of the stairs for added safety. *Split unit air conditioning for both cooling and heating is available in all bedrooms and living areas . There is a cot, a car seat, hair dryer, Safe Box and private parking . DISTANCES A short walk to the bus stop. A local bus service connects Kissonerga with Paphos town and Coral Bay resort and beach. Vardas Beach with sun loungers and restaurant is a short walk of about 500 m from the villa. Walkable to supermarkets, pharmacy, coffee shops, restaurants and the beach.